One of the 10 principles of intuitive eating is interoceptive awareness, the process of recognizing and processing internal, physical sensations that can exist as hunger, satiety, rapid heartbeat, or the rush of heat felt during panic. Interoception promotes conscious awareness of these sensations through attunement or being “in tune” with oneself and one’s body 1,2. In recovery this means asking questions like “where in my body do I feel hunger, fullness, or stress?”. The practice of interoceptive awareness ultimately helps cultivate a deeper trust in one’s body, which is essential to be able to recover from a dysfunctional relationship to food. One simple way to practice interoceptive awareness and increase body attunement is by trying to detect your heartbeat without touch or by following your breath in your body. Yoga is also powerful way to practice interoceptive awareness.3,5 When practiced with full presence and internal connection, yoga offers the opportunity to increase body connection through mind-body awareness. Each breath, pose, and meditation promotes the body’s innate wisdom allowing one to recognize, process, and trust internal sensations.3,4,5 In this way, yoga facilitates interoception, by promoting awareness of the whole self: body, mind, and soul self . Relationship with Food. Oakland, CA: New Harbinger Publications, Inc.; 2017.
associated with interoceptive sensitivity. Effects on body mass index. Appetite. 2013;70:22-30. doi:10.1016/j.appet.2013.06.082. Women Practicing Yoga. Eating Disorders. 2009;17(4):273-292. doi:10.1080/10640260902991111. awareness in experienced meditators. Psychophysiology. 2008;45(4):671-677. doi:10.1111/j.1469-8986.2008.00666.x. Part of what intrigued me most about interning with Anastasia Health is her holistic approach to disordered eating, which includes offering yoga therapy as a course of healing and treatment. My first experiences with yoga began about five or six years ago when I sought out ways to diversify my exercise routine. The gym I visited regularly happened to offer classes to its members and I often watched curiously through the glass windows at the synchronizing yogis, as I reluctantly clung to my habit on the treadmill. Eventually, I would join my first class, forever transformed. I quickly became enamored with the uplifting, holistic effect of each experience. Yoga is much more than a physical movement - it has become a form of grounding, anxiety and stress relief, creativity, playfulness, spiritual meditation - a way to care for myself, my body, my mind, my soul. It has helped me increase awareness of my internal dialogue and thoughts - creating space for loving gentleness, kindness, patience and peace toward myself and others. The practice of yoga is innately therapeutic, and for many, has been incorporated into their days as a way of life. Yoga has significant benefits on stress marker levels, flexibility, respiratory and cardiovascular function, anxiety, depression, pain, sleep and overall quality of life. By addressing an individual as a whole being where the function and wellness of the body, mind, and soul are intricately intertwined and cannot be healed apart from the other - it is no wonder yoga therapy is considered a complementary and alternative approach to medicine. Yoga therapy is particularly influential as a complementary approach to treatment for eating disorders. Eating disorders are often categorized as anxiety disorders, in which individuals cope with emotional and psychological issues through objective manipulation of their physical bodies and behavior. Individuals who struggle with disordered eating also generally experience disconnection from and discomfort with their physical bodies - often ignoring or completely out of tune with hunger and fullness cues. The practice of yoga can be considered an embodiment or external expression of what is happening internally within the individual. By intently focusing on each breath and movement - one is brought to an awareness of the physical and emotional feelings that are present. With pauses in the stillness, an individual can be gently guided to confront anxieties, which in our typically fast moving pace we tend to bury or flee from, often resulting in harmful behavior as a means to cope. This increased sense of self-awareness facilitates a unique process of healing and attunement to our needs and respect for our bodies. Regular yoga therapy has been shown to significantly improve body satisfaction in individuals who participate in as little as 30 minutes of yoga per week. Ultimately, yoga therapy is a self-healing practice, the frequency, and duration of which are based on individual needs. Yoga can be complex and approached from various styles, however, it can also be as simple as breathing into the depths of the belly or taking a few minutes to sit in a squat to start to feel a shift in energy and mood. [1.] Woodyard, C. (2011). Exploring the therapeutic effects of yoga and its ability to increase quality of life. International Journal of Yoga, 4(2), p.49. [3.] Neumark-Sztainer,D et al. (2018). Yoga and body image: Findings from a large population-based study of young adults. Body Image, 24:69-75. "The most profound act of kindness we can offer to ourselves and our body is to listen without judgment, especially when it comes to understanding our food cravings and our bodies"
In what ways can we view our mental and emotional reactions on the mat as lessons that reflect a need for further growth? I have witnessed how many patients who come to me for nutrition therapy, for instance, become attached to taking yoga classes without actually making progress in healing from their eating disorder. They often bring their disorder onto the yoga mat, approaching the practice as another way to burn calories or to push their body beyond limits, reinforcing a disconnected relationship to the body’s wisdom. I feel very honored to have been interviewed for a Recovery Warriors podcast on yoga and eating disorder recovery. Please listen by clicking the link below. "For Anastasia Nevin MS RD RYT yoga became a profound spiritual practice that helped her overcome an eating disorder and realize that we are not just a body, but we are spirits and we have souls. This appreciation and awareness awakened the calling to becoming a healer and a teacher. 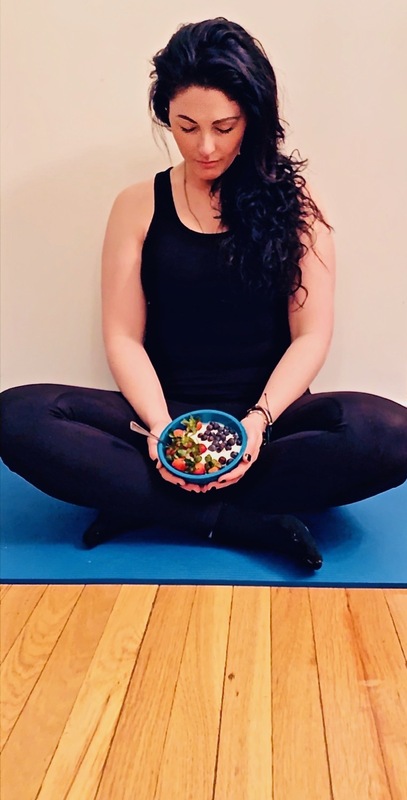 Full circle, Anastasia now helps others heal from their eating disorder by integrating nutrition therapy and yoga, the two things that helped her overcome her personal battle. In this show, we talk all about yoga and the many deep lessons it can teach if you are willing to show up on the mat to learn"
I made this recipe a few weeks ago and wanted to share it with you because it is simple, delicious, and Vata-Soothing. In Ayurveda, the sister science to yoga, Vata dosha is the constitution associated with the Fall and a dry, light, airy, etherial, and irregular qualities. Grounding, warm, cooked and sweet foods like root veggies are balancing for Vata. If you are interested in learning more about Ayurveda, contact me for a consultation. To make the recipe, I bought a bag of sweet potatoes, rinses, boiled them and peeled the skin off. (you can also roast the sweet potato with coconut oil for a more toasty flavor). I then added 1 can of light coconut milk and minced fresh ginger into the sweet potatoes and blended with my immersion blender. Add salt to taste. I cut up some cilantro and crushed walnuts on top for garnish. Enjoy! Check out my latest post on Recovery Warriors about how to cultivate a practice of faith on the yoga mat.